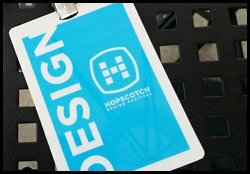 I had big fun last week attending the two-day Hopscotch Design Festival in Raleigh, NC. Hopscotch brought together visual communicators from lots of different backgrounds, representing every conceivable esthetic and showing off boatloads of smart, beautiful and downright nutty designs. The conference itself had no overt theme, but the sessions I attended featured information architects, software developers, architects, curators, graphic designers and artists echoing Brian Singer’s question: Are You Responding to What’s Going On Around You? Brian Singer is Design Manager at Pinterest, but his Hopscotch remarks dealt almost exclusively with his art projects. In 2000, he launched 1000 Journals. He and fellow artists decorated the covers of 1000 blank journals and sent them to anyone who asked for one. Each recipient adds something to a journal – a story, drawing, photo – and then passes it on to someone else. The journals continue to travel the globe inspiring folks to share and react. Brian’s now working on 1001 Journals, which takes the journaling concept to nonprofits and communities where creative and emotional outlets are needed but perhaps in short supply. “The 1001 Journals project has surpassed any expectation we may have had in the therapeutic value of teenagers being able to chronicle their feelings…” This from an administrator at UCSF Children’s Hospital, Singer’s first nonprofit partner in 1001 Journals. Check out the ways other communities are using his journals for healing. Singer started 1000 journals as an art project, but it’s easy to see now that his work is about communicating, community-building, trust and vulnerability. He continues to follow the project where his collaborators take it. Are you alert enough to what’s going on around your work to let it take you someplace necessary and unexpected? How would your collaborators, your employees, your customers answer the question?